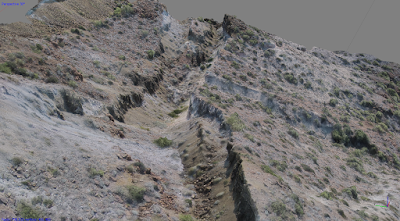 The Black Canyon City landslide (BCL) is a spectacular deep seated structure located northeast of Black Canyon City, Arizona. It does not appear to pose much harm to structures etc. but it is an interesting feature worthy of study. Such examinations are useful for understanding the geologic setting under which they develop (in this case bedded Tertiary rocks and good local relief), appreciating the potential contributions to the landscape evolution in the area with a similar setting, and for characterizing the underlying structural processes. Figure 1. 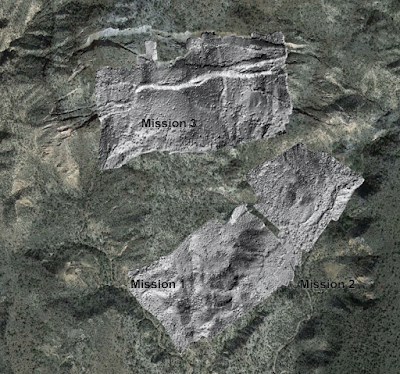 Google maps of the Black Canyon City landslide area. Ferguson, C.A., Haddad, D.E., Johnson, B.J., Guynn, J.H., Spencer, J.E., and Eddy, D.L., 2008, Geologic map of the east half of the Black Canyon City 7 ½' Quadrangle and the west half of the Squaw Creek Mesa 7 ½' Quadrangle, Maricopa and Yavapai Counties, Arizona: Arizona Geological Survey Digital Geologic Map DGM-64, 1 sheet, scale 1:24,000, with 27 p. text. Hurien Helmi is working with me on an M.S. degree and he has chosen to focus on the BCL which should be really great! As part of Hurien's work, we have wanted to produce high resolution maps of the BCL. Hurien has done some work with our balloon systems, but the BCL is in a fairly windy place and thus it has been a bit of a struggle to get good results. Yesterday, we went to the BCL with Professor Srikanth Saripalli our SESE colleague and flew a drone there with good results (hence the topic of this blog entry). I want to summarize the results of the Structure from Motion results from the trip. Stay tuned for Hurien's careful work. 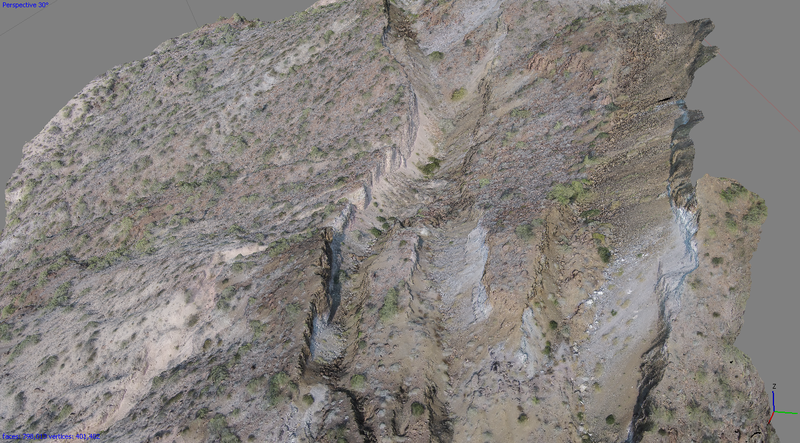 This effort is also part of a project with JPL colleagues exploring the power of structure from motion with applications to topographic mapping from space (GAZING). Sri bought a new DJI Phantom 2 Vision Plus and we used it along with the PIX4D app running on his phone. It worked quite well in that we were able to fly for effectively 15 minutes on each of two batteries (about 10 minutes of mapping time--as indicated in the app). Figure 2. Overview of the three missions presented as hillshades computed from 0.1 m per pixel digital surface models. Along with the field acquisition challenge, I wanted to see the differences in results from two main pieces of Structure from Motion software: PIX4D--for which Sri has a license--and Agisoft Photoscan--with which my students and I have more experience (and for which we have a license). In this presentation, I will only show the results from Agisoft Photoscan given their cursory nature. I computed 3D models and present short videos of the texture mapped meshes from Photoscan below as well as a few screen captures. 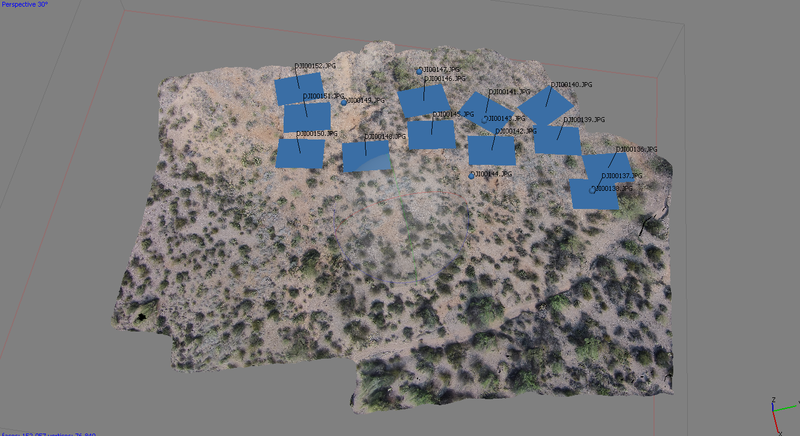 Very importantly, the 3D georeferencing only comes from the GPS tags in the original jpgs from the Phantom!. 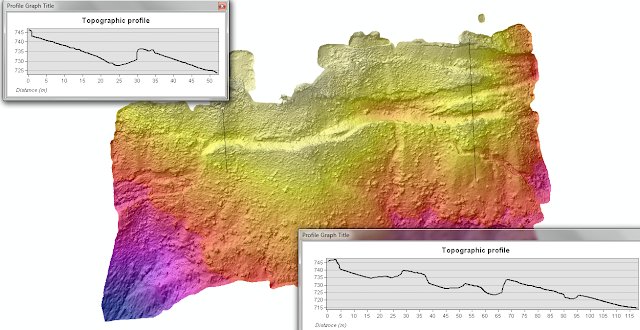 In addition, I computed digital surface models (DSM) from the models and exported 10 cm versions as geotiffs which I loaded into ArcMap and computed hillshades and cut a few topographic profiles. 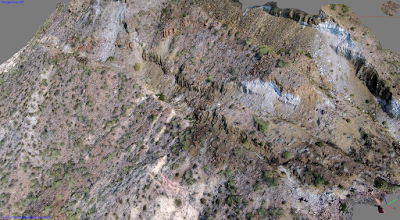 Aside from the topographic tilt and some other georeferencing issues, the results are impressive for a relatively low amount of effort. It seems that the software can manage the fisheye lens view from the Phantom's camera. Mission 1 (10 minute flight 80 m above launch point): We covered the toe area of the slide in mission 1. The results are pretty good aside from a gap in the coverage. Figure 3. Mission 1 overview. Camera positions are indicated as blue rectangles (used). The "lawnmower patter" is evident. Figure 4. 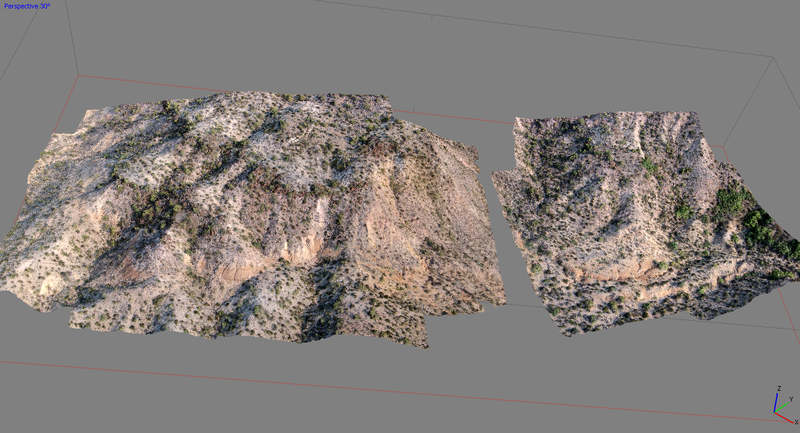 Mission 1 texture map 3D view. 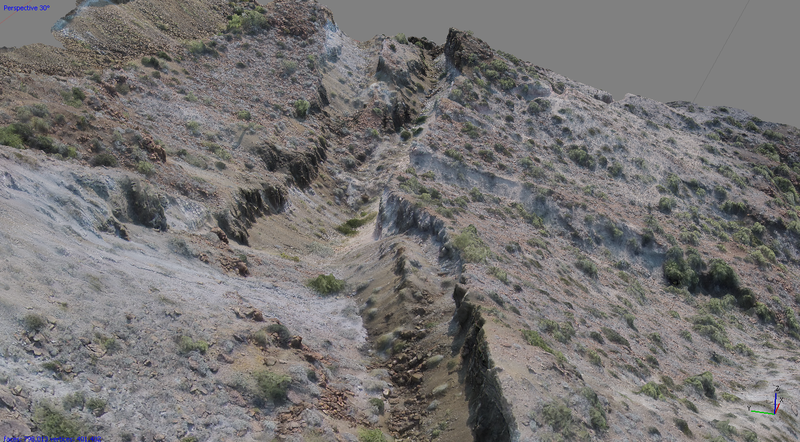 Mission 2 (4 minute flight 40 m above launch point): We made a small flight over the toe area where there are clear fault scarps associated with deformation of the slide (as well as significant fissuring and collapse features). Figure 5. Mission 2 overview. 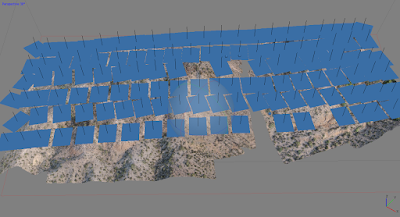 Camera positions are indicated as blue rectangles. Figure 6. Toe area DSM. Topographic model shows toe scar well but the whole model has a northwestern tilt due to the simple GPS control on the images for georeferencing. Figure 7. Mission 3 overview. 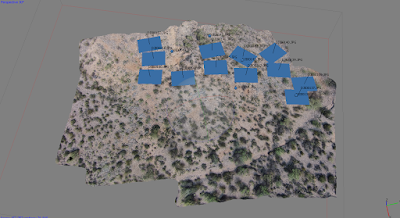 Camera positions are indicated as blue rectangles or dots (not used?). Figure 8. 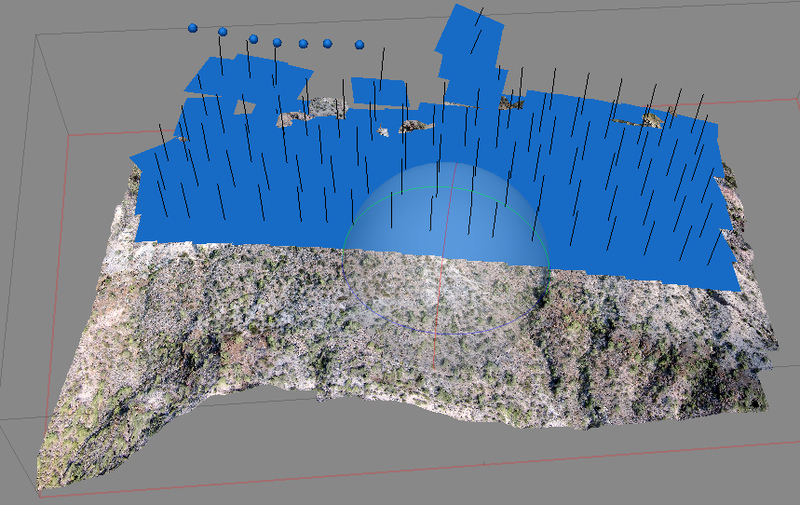 3D views over textured mesh of upper portion of slide. Figure 9. Upper portion of the slide DSM. Extensional features are quite evident with 10 m deep troughs. Georeferencing is ok.